Cross-trained in Tae Kwon Do, Wing Chun, Ninjitsu, and Tai Chi and trained for four months in China’s Shaolin Martial Arts Academy. 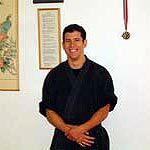 Karl was one of Martial Way’s first students in 1998, and participated as a Tiny Tiger, then as a Junior, then a Teen and finally as an Adult. He is a patient and knowledgeable instructor who works well with all ages and levels of students. Martial Way is focused and determined to serve our students with the highest possible quality of instruction and service. Our students range from all ages and abilities with a variety of fitness goals. Learn more about Martial Way, our teaching staff and our programs or schedule a visit to one of our schools. Interested in martial arts for your child? Looking for fun with a purpose? Want to try out our program before committing to lessons? Sign-up for a camp instead! Check out our Summer Martial Arts Camp for kids! We value our connections with students and families. Please like us, follow us, and watch our videos. © Martial Way Self-Defense Center. All Rights Reserved.